I’m not going to tell or show you exactly how to change strings on your guitar today. There are plenty of video guides out there to help you with that (see below). Instead I’m talking about the ‘why’ and ‘when’ side of things. Why do I need to change my strings? They’re not broken! All guitar strings, regardless of their make and model, are subject to aging. That is to say they get over-stretched through constantly being under tension, through the process of tuning and through use. Acids, grot and grime from the left hand, and the action of being pressed against the frets will wear the strings at one end, and the action of nails on the guitar and other right hand techniques will wear the strings at the other. So as the strings get older they will be harder to keep in tune. They will also lose their original tone qualities and responsiveness in terms of the different tones you can extract from them when playing. The bass strings in particular, the ones that are typically wound with a metal, will quickly lose their out-of-the packet “zing” and brightness. Typically the newer the better with the bass strings. How often should I change the strings? So in answer to the above question, the answer is you do need to change your strings somewhat regularly to ensure your guitar and your playing sounds its best. Not to mention it will be easier to keep in tune, and be that bit extra bit easier to play, not having to squeeze the life out of the guitar to get some nice sounding notes out! For the person that’s playing a few times a week, say half an hour to an hour at a time, most days, I’d say changing your strings about 3-4 times per year is probably about right for you. Again this is very much dependent on those dot points listed above, as well as financial considerations of course of replacing strings. If you’re performing, you have a recital, a concert or an exam, I would definitely recommend putting a nice fresh set of strings on about a week or so before your performance. This gives the strings time to settle in, whilst also retaining that awesome out-of-the-box sounds quality. 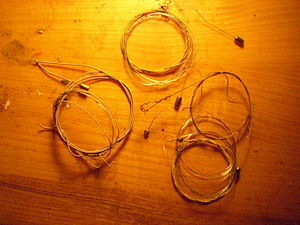 It’s really not as difficult, fiddly or time-consuming as you think it might be to change your guitar’s strings. Ok, it may take a bit of getting used to for the first couple, but you’ll soon get into the swing of it. Taking it to your local guitar shop for them to restring is really money for old rope (or should that be old strings?). And what happens when the shop is closed or you’re not near to a shop when it happens? Ask your teacher to show you how to do it. Any teacher worth their salt will gladly show how to carry out this essential piece of maintenance. Avoid taking off all the strings at the same time. Whilst doing that can aid in the cleaning of the fingerboard or soundboard, the sudden change in tension can be detrimental to the neck and soundboard of your guitar. Change them one-for-one. That also minimises the risk of putting the wrong string in the wrong place. When you have a string off the guitar, give the space under the fingerboard a quick wipe with a clean, lint free cloth, and the same on the soundboard. This just removes any grime build up and dust, and keeps your guitar looking as schmicko as you make it sound! If anyone wants any tips on the types of strings to use, feel free to ask in the comment box below or contact me directly and I’ll be happy to chat further. Next postIntroducing Rising Star of the Classical Guitar Daniel Nistico…..Ooh and hear about the Adelaide International Guitar Festival too! My Cordoba C5 has a truss rod, so removing all of the strings at the same time shouldn’t affect the neck, at least, that’s the impression I’ve gotten from Cordoba and other manufacturers. As with anything, results may vary. I haven’t changed the strings on my C5 yet (only had it 6 weeks), but have 3 other guitars. Martin Company even says you can do it with their guitars, since it’s a good time to clean up the frets and fretboard with the strings completely removed. Just saying…..thanks for the article.